Why Do I Keep Seeing Commercials For Everest University? Commercials for Everest University continue to appear on TV, because the schools are now operated by Zenith Education Corp. If you’re sitting at home watching television on any given afternoon, you’re likely to see a few commercials touting the supposed convenience and benefits of attending a for-profit college. 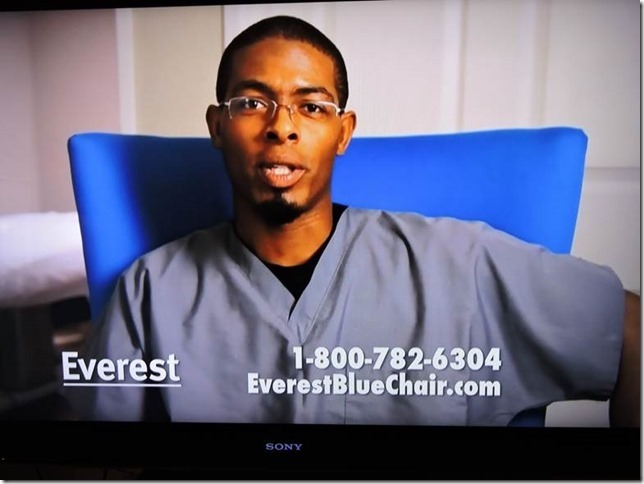 But with the recent, very public collapse of now-bankrupt Corinthian Colleges Inc — and the closure of many of its schools — you might be wondering why your Jerry Springer show is being interrupted with ads for Everest University. That’s because, if you remember, another company – Education Credit Management Corporation – swooped in to purchased 56 Everest and WyoTech campuses in various parts of the country, just two months before CCI’s remaining Everest, Heald College and Wyotech campuses were closed. When ECMC revealed its plans to purchase the beleaguered for-profit brands, it announced it would run the schools under its new Zenith Education Group division and transition them from for-profit to nonprofit status. Additionally, the company said it would create a program to eliminate some of the schools’ worst performing programs and remove binding, mandatory arbitration from enrollment agreements. Despite these changes, the commercials for the new Everest are remarkably similar and give the impression that things are business as usual, as one reader tells Consumerist. While our reader was right to think that it was odd for a company that had closed to continue advertising, it turns out the Everest schools in his area are actually continuing to operate under the Zenith Education Group. That only brings up the question: If your company spent $24 million to buy schools with a brand name synonymous with inflated graduation rates, federal investigations and unfair business practices, wouldn’t you maybe change the moniker and branding? One might think that would be the logical step for a corporation, but it’s not always economically feasible. And that’s apparently the case with ECMC/Zenith and the Everest and WyoTech schools it purchased. Dave Hawn, President and CEO of ECMC Group and Interim President and CEO of Zenith Education Group, tells Consumerist in a statement that the company understands consumers’ confusion about what schools have closed and which remain open under Zenith leadership. To be clear, there are currently 46 Everest University campuses and three WyoTech campuses still operating, while another seven Everest schools are on a teach-out program, meaning they are no longer enrolling new students. “Although we considered rebranding, it would be a lengthy and expensive process for more than 45 schools, and we would rather invest those funds in programs that directly support student success,” Hawn says. But it wasn’t all about the money, he says. In fact, he contends that keeping the name has made it easier for students. So it doesn’t appear that Zenith is worried about any kind of negative connotation that might be attached to the Everest or WyoTech names – familiar commercials or not.